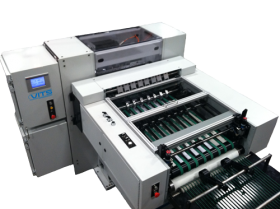 The VITS SPRINT variable data rotary cutter is the latest in advanced servo technology designed exclusively for the digital press market. So advanced, its cam profile drive technology is patented. Developed to provide variable speed profiling to allow not only cut length changes but take on-demand chip sizes with the press of a button.